PSA: Mndsgn & Ivan Ave will now be joining us in Auckland !! 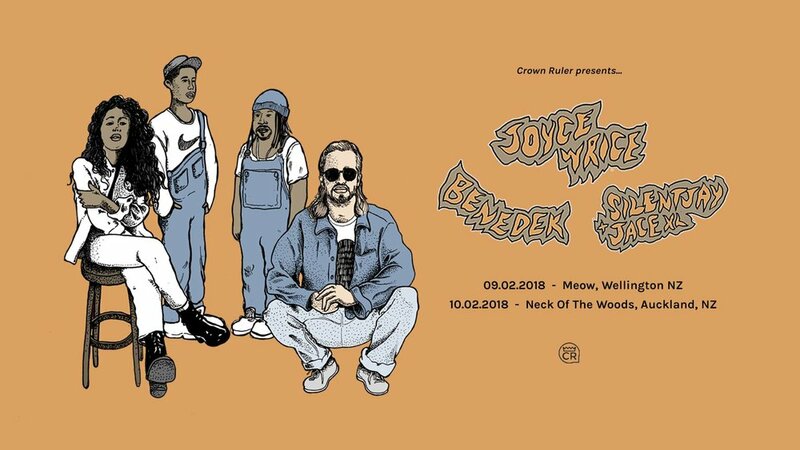 This summer Joyce Wrice, Benedek & Silentjay & Jace XL are making a mission across NZ. For all those people who have been bumping Ivan Ave and MNDSGN’s Low Jams EP every morning since their Soundcloud-savvy mate bopped them over the head with it in 2014, blushing at the smile in Joyce Wrice’s maple syrup coated pipes when she serenades them on I Want You, closing their eyes and pretending they’re floating in a marshmallow funk paradise to the soundtrack of Bene’s World, fashioning a damn near perfect zoot for their significant other to the soundtrack of Silentjay & Jace XL’s Rockabye… Gear yourself up to see the all stars mentioned above, live (! ), on the same night. Hailing from Los Angeles, Oslo & Melbourne, each artist has had a unique contribution to the re-imagination and amalgamation of RnB, boogie and hip hop – in their own right, and across the countless collabs shared amongst them. And, to answer the question plaguing your mind; yes, these collabs will happen before your very ears! Limited tickets available now via Eventbrite, so make the click towards a funkier future.